You've created a world of heroes and villains that could easily translate to the world of comics. Have comics or graphic novels influenced you at all? DON'T KILL ME but I'd actually never read any comic books before I wrote Renegade X. I'd just never really had the chance to read any, except some old Donald Duck comics I had as a kid that don't really count. (I remember a part where Huey, Duey, and Luey are looking at a river and talking about the "rapids." I couldn't figure out what they were talking about and thought maybe the rushing water looked like "rabbits" and that that's what it meant somehow.) But I'm a total sucker for superheroes and LOVE all the movies that have been coming out. (Yes, ALL THREE Spider-Man movies.) And I'm chomping at the bit for Iron Man 2 to come out already! 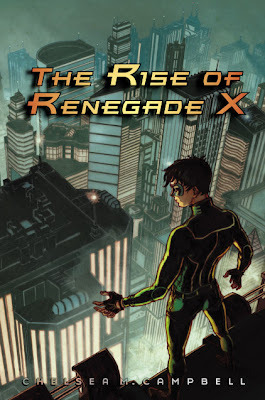 Which character in The Rise of Renegade X do you most closely relate to? Which was the most difficult for you to write? Damien. We think a lot alike, which I think might surprise some people. The most difficult for me to write was Gordon, Damien's dad. He really believes in being good and doing the right thing, according to a predetermined set of rules, all the time. It was hard to blend that with him being a real person with problems and flaws and maybe wanting to do the right thing all the time, but sometimes misjudging it. Tell us a little bit about the setting for the book, Golden City. Is it a mish-mash of real cities or an entirely fictional one? Golden City is entirely fictional, though it is set in the U.S. (Damien mentions this a couple times early on, plus the characters, to me at least, seem very American.) In this alternate version of our world, superheroes and supervillains exist and, depending on their genetics, their thumbprints rearrange themselves on their sixteenth birthdays to form either an H or a V. Damien, having parents from both sides, gets an X. He thought he had everything figured out, and now he has to figure out who he is all over again. Golden City has the highest percentage of heroes and villains in the country, so a lot of their culture is based on hero and villain stuff, and it's where tourists go if they want to see a superhero (or get mugged by a supervillain). Disney Original Movies has optioned the film rights to The Rise of Renegade X. If you had your pick, who would play Damien? Sarah (The Cosine Kid)? Kat? 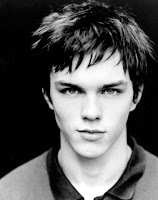 If I had my pick, Damien would be played by Nicholas Hoult (About a Boy, Skins), who I hear can do an American accent. (And he sings!) For Sarah, I'd cast Hayden Panettiere from Heroes--think of her in her Malcolm in the Middle days, though, and I think you'll see why I picked her. As for Kat, no one really comes to mind, though I'm sure there are a lot of people who could play her. This is a tough question. In the world of Golden City, I think I'd rather be a villain, since they have more freedom and don't have to take as many photos with tourists. In, like, Gotham or Metropolis, though, I'd rather be a hero. Thanks to Chelsea for a wonderful interview and for donating prizes for this great contest. Make sure to pre-order your copy of The Rise of Renegade X. *Description and author bio from Amazon. This is my first visit to Wastepaper Prose - way cool blog layout!!! I remember reading the PM blurb when Chelsea sold this book and was instantly intrigued. I'll be first in line on release day. Congrats, Chelsea! Thanks for the contest and great interview...can't wait to read this book! Love the interview and thank you for this contest! 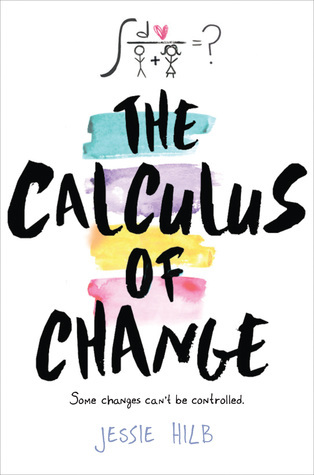 This book is already on my wishlist!